Yay! It’s time for another Creative + Mindful book report! 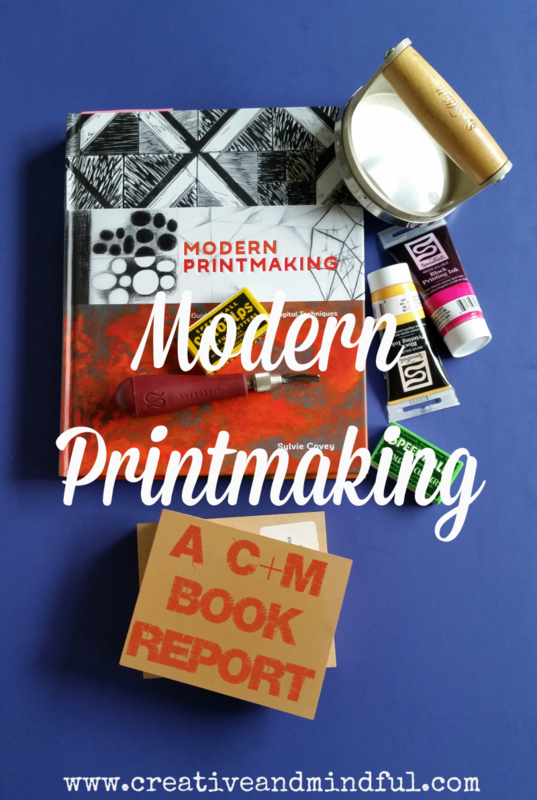 This time I had the pleasure of reading Modern Printmaking: A Guide to Traditional and Digital Techniques by Sylvie Covey. I was particularly excited to get my mitts on this book. because I’ve been looking for new ways to print on fabric. I knew the book would include a lot of stuff that might be irrelevant for that purpose but I figured I could get some ideas. Holy moly, what a gorgeous book! So, the content aside, it’s a NICE book. Like heavy, glossy pages nice. The publishers went all out on this and I’m proud to have a copy. In fact, I think it’s a perfect – and unique! – coffee table book. Now, for the content. I was really pleasantly surprised. While some of the printmaking techniques require rather expensive tools or supplies, Covey did an incredible job of comprehensively covering how each technique is done. There are numerous technical photos of each printmaking process along with easy to understand descriptions of the steps. After reading this book, I think I actually know enough to create intaglio prints and lithographs if I got access to the tools and supplies. Drawing well enough to create something other people would want to look at?… well, that is not a covered topic. Aside from the technical aspects – and the primary reason I assert that this is a perfect coffee table book – are the amazing images of other printmakers’ work. Covey included dozens of images of artwork from all over the world. It’s fascinating to compare a print made digitally versus one that is made using a manual process. While I did know a little about the history of printmaking and some of the simpler techniques, I learned a ton from Covey. I highly recommend Modern Printmaking to anyone who is interested in the topic, whether for the technical skills or simply for the appreciation of these methods and the amazing art they produce. Solid A+ for this beautiful book! Oh, and I did get some great ideas and inspiration for my own fabric printing project. Silk screening, collagraphy, linoleum prints… keep your eyes peeled on my Instagram!